KAF financial Advisors introduces eMoney 360Pro a remote collaboration tool to help clients manage their complex financial world. eMoney 360Pro allows our clients a wealth management solution that integrates every aspect of their finances. They can stay abreast of their insurance, mileage awards, accounts, brokers, stocks, mutual funds, lawyer, banker and CPA all in one centralized location. 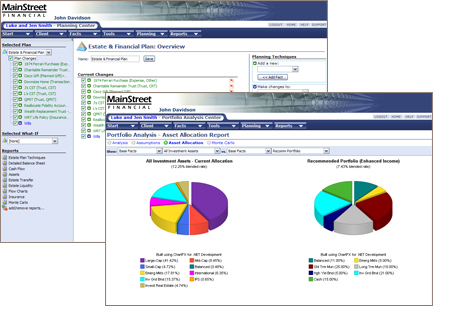 Your portfolio is automatically updated on a daily basis and with a click of your mouse you can keep track of your financial position anytime, anywhere. In a secure, password protected web based system that can be accessed anywhere you are. Instead of spending hours tracking down important documents or playing tag with your advisors you can logon to eMoney 360Pro and access everything that impacts your financial picture. You can also create remote collaboration with your professional advisors to keep everyone on the same page saving you time. Whether you are in New England or Florida eMoney 360Pro allows you to stay on top of everything that affects you financially. For more information on eMoney 360Pro please contact us at 781-356-2000 - Tom Hoffman, ext. 1171, Max Petrie, ext. 1122 or Susan McPherson, ext. 1171 or email them at thoffman@kafgroup.com, Mpetrie@kafgroup.com, smcpherson@kafgroup.com.